Last Monday of February, a month that used to be my favorite. Summer in Brazil, carnival (not that I was that much into it, but still, a big break from work in the height of the summer was always well-received). That all changed 23 years ago, when I first moved to France and then, a couple of years later permanently to the US. February is now a month I do my best to survive. I count the days for it to be over to get some hope of life percolating back into my veins. ANYWAY, I am sure you are not here to read me whine and pout. Instead, you are here for the reward of a revelation: which blog was my assignment for this month’s adventure with The Secret Recipe Club: it was the The Wimpy Vegetarian! I literally screamed with joy when I got the email notification, because as a regular reader of Susan’s blog, I felt totally at home “stalking” it. You should visit her “About” page, but let me just say that when she decided to become a vegetarian, or as she put it “to focus more on a plant-based diet“, her husband was not exactly thrilled. He went along with it for a while, but at some point started referring to “farro” as “horse food“. No bueno, folks. But Susan fought back using all the culinary skills accumulated from her classes at Tante Marie Cooking School, and turned veggie dishes (horse food included) into concoctions her husband could not resist. She succeeded big time, and her blog is there to show us how. There were so many dishes I bookmarked as tempting possibilities, but I narrowed them down to these: Rustic Cauliflower and Tomato Gratin, Arepas Rellenas (I even have the special flour to make them, so I must get to this recipe at some point), Skillet Baked Corn Pudding, Farinata (another recipe I’m always dreaming about), Sweet Potato Biscuit Pillows (excuse me, I need to wipe drool off the side of my mouth), Broccoli-Cheddar Quinoa Casserole Tart. Susan is a fantastic cook and often enters – and wins – cooking contests, so pretty much anything on her site feels quite special. Pay her a visit, and become a subscriber, even if you are not a strict vegetarian. 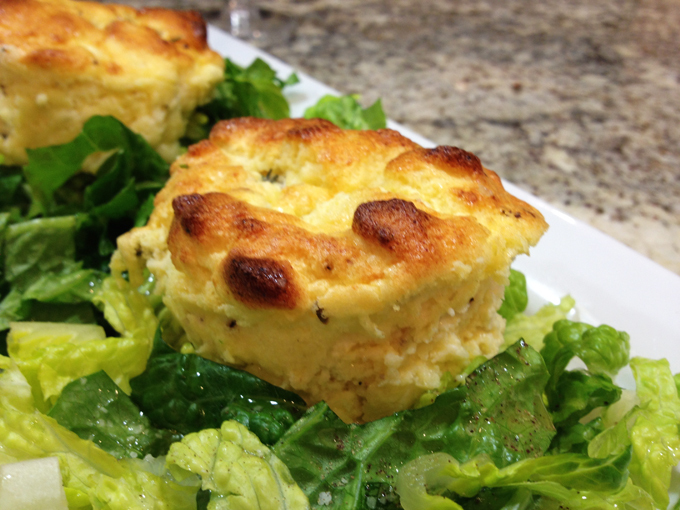 For my assignment, I went with very elegant Herbed Goat Cheese souffles. They turned out amazing! Heat the oven to 375 degrees F. Prep the ramekins by smearing them with butter and sprinkling grated Parmesan cheese on the bottoms and around the sides. Set aside. Rub the dried lavender between your fingers to reduce as much as half of the buds to a powder. Combine this with the lemon zest, 1 tablespoon of Parmesan, salt and pepper in a small bowl. Set aside. In a medium bowl, combine the goat cheese, ricotta, 2 tablespoons of Parmesan cheese, thyme, honey, egg yolks, milk and flour together. Stir well to completely combine. Add to the reserved lavender mixture. In a small bowl, whip the egg whites just to a firm peak. Be careful not to get them too firm, or they’ll be difficult to fold into the cheese-yolk mixture. Fold the beaten egg whites into the cheese-yolk mixture in thirds using a large spatula. It’s fine to have lumps of egg whites in the mixture – it will not be smooth. Place the ramekins in a baking dish and fill the dish with hot water one-half the way up the sides of the ramekins. 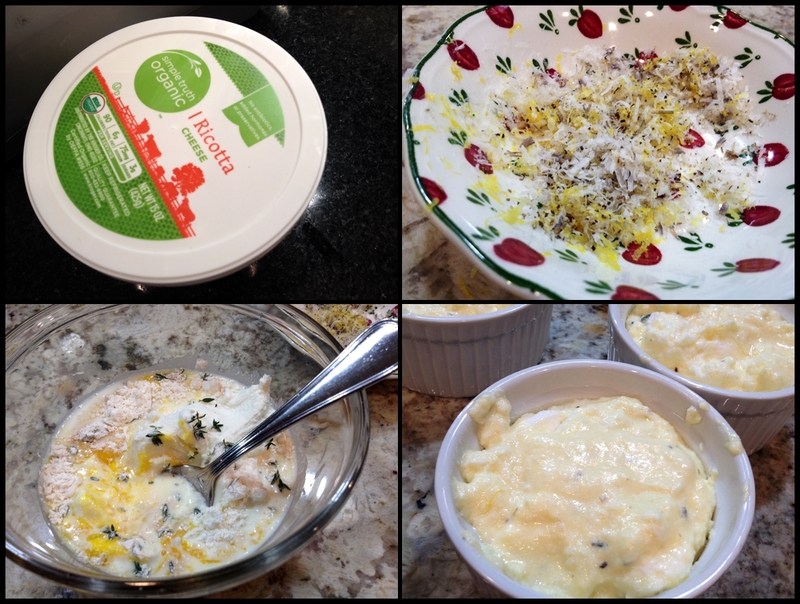 Carefully spoon the cheese-egg mixture into the ramekins, filling them 2/3 full. Bake for 20 minutes, or until browned on top and springy – firm to the touch. Remove and allow to cool in the ramekins for 15 minutes. 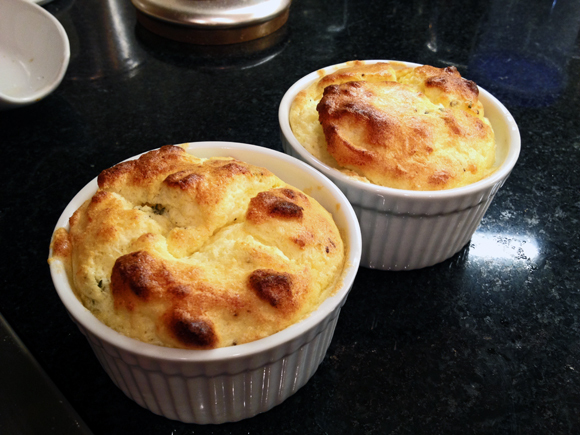 The souffles will collapse and start to pull away from the sides of the ramekins. Run a knife around their edges and turn the ramekin upside down. The souffle should slide right out. Comments: What I loved the most about the recipe was the inclusion of lavender. It gave the souffle a sort of unusual component, Phil could not guess what it was, but once I told him it was lavender he could detect it. You need to add just a small amount, it is quite potent, don’t go crazy with it. I was also surprised by the method of preparing the base, as I always make a bechamel type sauce. For this recipe, you mix it all and do not pre-cook, it goes straight into the oven, in a water-bath environment. Because I was afraid the mixture was a bit too liquid, I added double the amount of flour. Not sure it was necessary, but they ended up with a very nice texture, and un-molded easily. This is the type of recipe that would be perfect for entertaining, or for that special dinner for two, candlelight and all… a first date, a first year anniversary, you catch my drift. Any meal will be special when these are part of the menu! For my readers, the usual reminder to poke the blue frog at the end of my post. She will take you to plenty of great recipes made by my fellow virtual friends at The Secret Recipe Club.